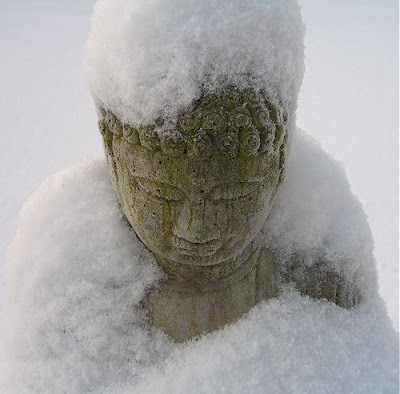 Om mani padme hum - Hail to the Jewel in the Lotus - is the mantra of Avalokitesvara, the Buddha of Compassion and Patron Deity of Tibet. The word mantra is composed of two syllables - 'mana' and 'tara', suggesting mind and protection. This literally means 'protection of the mind' from the influence of those perceptions and understandings which give rise to deluded states of existence; a concept surely as relevant today to media executives and bankers as it was when Siddhārtha Gautama attained enlightenment some 2500 years ago. Just forty years ago Karlheinz Stockhausen used the title Mantra, meaning 'melody formula', for his return to fully notated composition which is scored for two ring-modulated pianos, antique cymbals, wood block, and a tape of morse code. The recording by Yvar Mikhashoff and Rosalind Bevan, pianos and percussion, and Ole Ørsted, electronics is seen below. This excellent and elegantly presented New Albion CD includes in its notes a passage about mantras as 'sounds that make one see' from Sri Aurobindo or the Adventure of Consciousness by Satrem, an author and free thinker well worth investigating. You can hear Om Mani Padme Hum intoned by the chant master (Omze la) from his mala (rosary) and accompanied by the monks of the exiled Tibetan Tashi Lhunpo monastery online as part of a sequence in which the mantra is framed by music from the tantric and monastic orchestras. The tracks are taken from the CD Dawn till Dusk which is seen below and which featured in Wagner and the Tantric Orchestra. 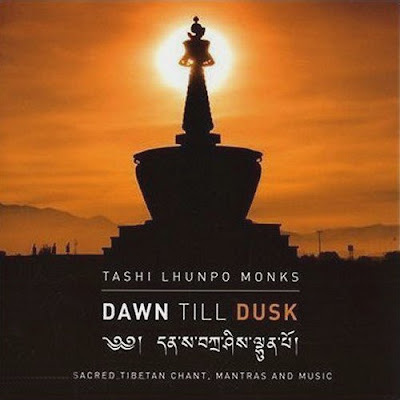 This sequence from the Tashi Lhunpo monks comes in My World of Music, a two hour programme sampling some of the music featured On an Overgrown Path. In the spirit of 'work in progress' I am using the freedom generously offered to me by Future Radio to experiment with some 'adventures of consciousness' and showcase some of the more unusual music from recent posts. My World of Music audio stream can be heard here, the full listing of online Chance Music programmes is here. Don't just listen to mantras - chant them!. I saw the Kontarsky Brothers perform Mantra in Toronto back in the mid ‘70’s. I also had their DG recording, which of course is no longer (easily) available, since Stockhausen took all his DG masters. Hopefully, with his passing, they will now be easier to find, and one doesn’t have to go through an expensive and time-consuming process to obtain them. 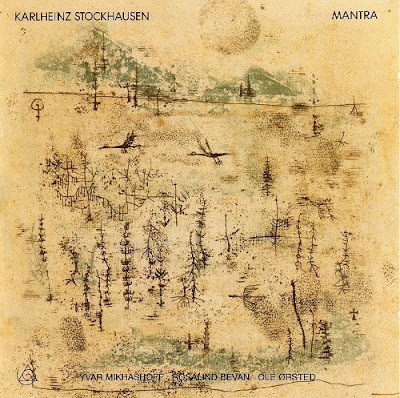 I think Stockhausen would be surprised to see Mantra described as his 'first fully-notated composition'.Mantra was a return to full notation rather than a brand-new start. ghooper - thanks, now changed. The New Albion recording is one of the best. Also, it may seem hard to believe, but there is a lot of humor in the piece, especially when the two pianists seem to get into a competition with each other, and it ends on a "wrong" note. I love this piece, but it may be hard to grasp without reading along with the score. At first I hated it until I got the score and followed along. That's when I realized how truly amazing Mantra really is.